Audi's Sport Quattro concept, featured this week at the International CES consumer electronics trade show, has laser high-beam headlamps. LAS VEGAS -- Audi CEO Rupert Stadler says he will introduce a production vehicle equipped with laser headlights, though he did not indicate which model will get lasers, or when. Stadler announced his plans for lasers Monday night during a flashy premier of the Sport Quattro concept, which features LED low beams and laser high beams. 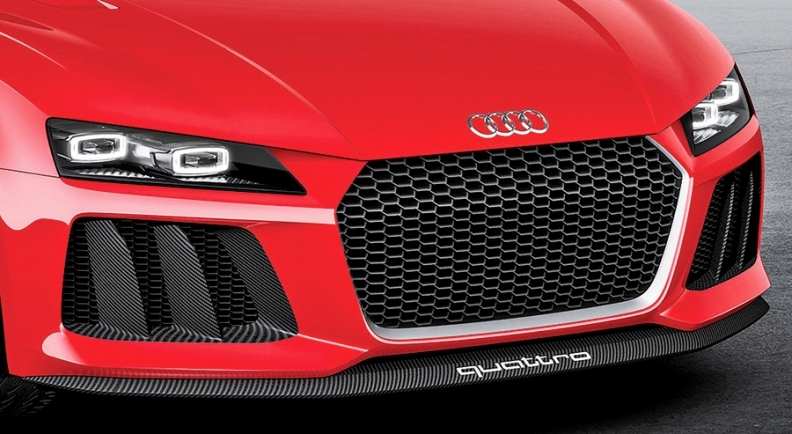 While he did not detail his production plans, Stadler did note that the 2014 R18 e-tron Quattro race car will have laser headlights. The chief advantage of laser high beams is their 500-meter range, which is twice the range of LEDs. On the downside, lasers are still costly and sensitive to heat. Audi first revealed its interest in lasers at the 2011 Frankfurt auto show, when the company unveiled an A2 concept car with rear fog lights powered by laser diodes. But rival BMW AG may beat Audi to the punch. BMW has announced plans to introduce laser high beams late this year as optional equipment in its i8 plug-in hybrid coupe, although they won't be available in U.S. models.